Speaking of the 70’s. We were at CFS Lowther in 1977. It no longer exists of course, apart from a patch of tall grass and Black Flies. but I often went down to the ATC center in North Bay and to visit friends in “the hole.” Most days, even on cold and rainy ones, I would make some time to wonder around the CPRail facilities. Remember those days? No passes, no restrictions, no hard hats, safety vests and steel-toed shoes. Just a simple wave of the camera and you were on. I would always pay a courtesy call to the yard office though just to give someone my name. 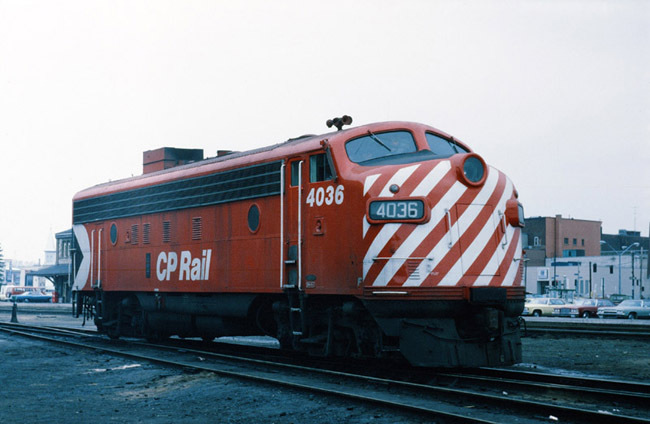 The Action Red, Pack-Man, Candy stripes scheme was relatively new back then and most CP fans and modellers hated it from the get-go. And just look around, that old maroon and grey scheme still haunts the basements of the world. For me this was something kind’a special though. I had spent a lifetime watching the comings and goings of CN and so had developed a kinship with that line. I remember the first red, black and gray trains and I was amazed at the style and the colours. A breakout image at the time. The CP “corporate image” left me cold somehow. It looked ok on trucks and ships I guess but I felt it destroyed the trains and the planes. Anyway, 4036 is a case study in ‘basic’ both in colour and accoutrements. Apart from the simple, box like winterization hatch this engine is a stripped down, right off the factory floor, don’t bother me with extras machine. An early Athearn product for sure.